2015 Nissan X-Trail 1.6 DIG-T 163 review | What Car? The X-Trail has been around for a few months and, until now, has only been available with a 1.6-litre diesel engine. Although it is an economical unit with low CO2 emissions, it is expensive, with the cheapest version costing more than £23,000. That’s where this turbocharged 1.6-litre petrol engined model steps in. At just under £22,000, it costs around £1500 less than the equivalent diesel model. Of course, it’s not all good news; as you'd expect, economy and emissions aren't quite as impressive. Nissan claims combined fuel economy of 45.6mpg, which is 12mpg less than the 2WD diesel, and CO2 emissions of 145g/km, 16g/km more than the diesel (on 17in wheels). Still, if you don’t cover many miles, the petrol X-Trail could make sense. It's worth noting that the petrol version can't be had with an automatic gearbox or four-wheel drive though. 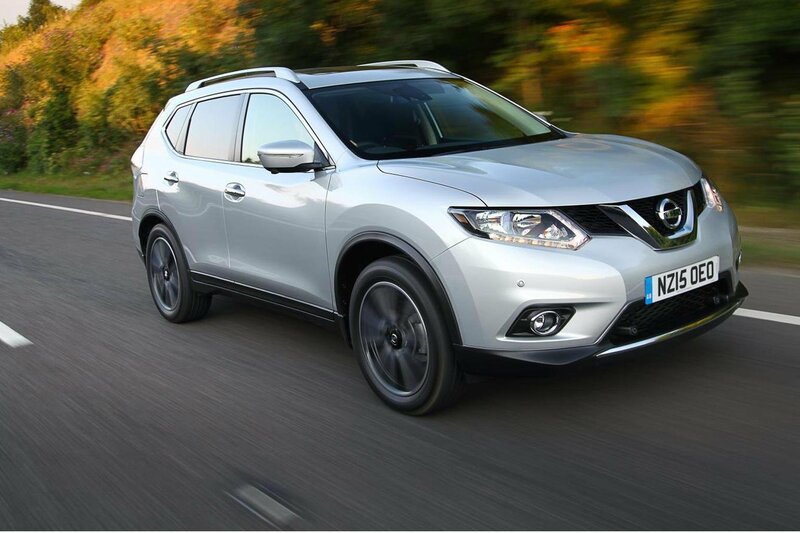 What is the 2015 Nissan X-Trail DIG-T 163 like to drive? Look at the figures and you might expect this version of the X-Trail to feel pretty nippy, since it's nearly a second faster than the diesel to 62mph, at 9.7 seconds. The trouble is that the petrol model produces its power far higher up the rev-range. Around 1500rpm higher, in fact. There’s precious little in the way of grunt below 2000rpm and we often found the need to push the petrol engine beyond 4000rpm to get anywhere near the performance claimed. At these higher engine speeds, there’s no doubt this engine does feel faster than the diesel model, but you’ll be burning plenty of fuel in the process, and you'll be using the engine very hard to achieve a decent pace if you've got a full complement of passengers. You'll also want to avoid the petrol X-Trail if you tow heavier loads. Not only will that shortage of torque be even more noticeable, but the towing capacity itself is lower, at 1800kg compared with 2000kg for the diesel. Overall, it's just generally not as easygoing as the diesel model, which offers gutsier-feeling mid-range acceleration and doesn't need much revving at all. The petrol engine is refined, though. Once up to speed, or even at idle and just pootling around town, it is noticeably smoother and quieter than the diesel. The rest of the driving experience is much the same. That means relatively soft suspension leading to pronounced body-roll around corners, although thankfully not enough to make your passengers feel queasy. Despite this, expansion joints and other sharp-edged bumps aren’t dealt with as effectively as you may expect. However, this may improve if you opt for 17in wheels instead of the 19in items fitted to our test car. The steering is a bit slow, needing more turns than you might expect. Although light at low speeds, the steering weights up nicely as you go faster and is precise enough to easily place the X-Trail where you want it. Road noise isn’t too intrusive and neither is wind noise despite a bit of buffeting from the sizable door mirrors. What is the 2015 Nissan X-Trail DIG-T 163 like inside? If you’re familiar with the smaller Qashqai, you’ll recognise much of the dashboard architecture in the X-Trail. There was plenty of soft-touch plastic, a sprinkling of metallic effect trim and even some faux carbon fibre on our test car. The lower reaches of the dashboard are hewn from more solid, unappealing plastics, but it all feels well put together. All the controls operate with a well-oiled precision and it’s easy for the driver to get comfortable thanks to plenty of adjustment in the seats and steering wheel. There’s also a standard centre armrest that hides a seriously spacious cubbyhole with charging ports. Legroom and headroom are plentiful front and rear (despite a panoramic roof on this example), and three adults should fit on the rear bench. If they need more space the rear seat can be slid backwards, too. A third row of seats can be added as a £700 option. These are definitely only fo occasional use, though, as legroom is tight and they're not easy to get into. Equipment is good, even on the bottom of the range Visia you get 17in alloys, a Bluetooth stereo with a USB input, air con and cruise control. N-Tec models and above gain a touchscreen sat nav. Despite the significant saving over diesel engined models, we would avoid the petrol X-Trail. While it provides more power, the lack of low down pull means you end up thrashing the engine far harder than you would the diesel. This dents fuel economy as our test figures reveal: we gained an overall real-world average around 35mpg in the real world; even driven carefully this only rose to around 39mpg on a mixed route. The petrol model is really only worth considering if you have a low annual mileage and are keen to save on the purchase price. Even then it comes with the same caveat as other X-Trails; a regular seven-seat MPV would offer even more space for similar money.